Police fired tear gas and used a water cannon to disperse some 8,000 protesters gathered in Paris Saturday for a second weekend of “yellow vest” protests, reports France24. 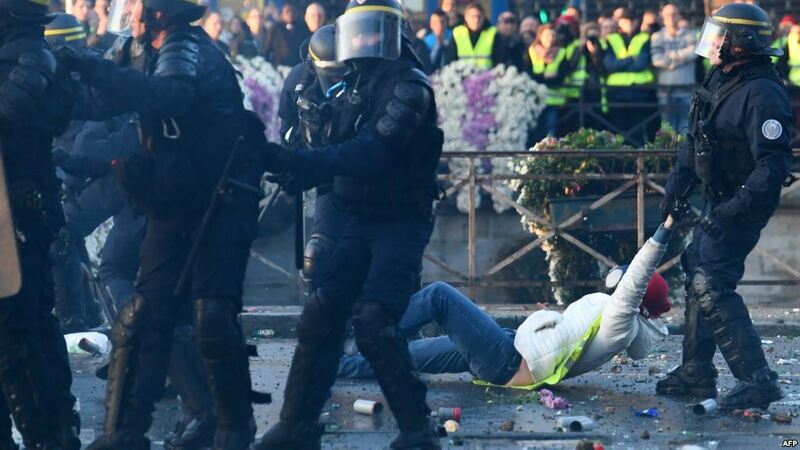 Protesters converged on the Champs-Elysées, where they faced off against police deployed to prevent them from reaching the nearby Elysée presidential palace. According to France24, for more than a week, protesters clad in the fluorescent yellow jackets that all motorists in France must have in their cars have blocked highways across the country with burning barricades and convoys of slow-moving trucks, obstructing access to fuel depots, shopping centres and some factories. The protesters are opposed to "climate change" taxes that Macron’s government has imposed on diesel – by far the most commonly used fuel in France – as part of a supposed stepped up efforts to fight against "climate change." Alongside the tax, the government has offered incentives to buy green or electric vehicles. Some 3,000 police officers were deployed in Paris on Saturday, according to city officials. Police are concerned that far-left and far-right extremists may infiltrate the demonstrations, escalating the intensity of the protests. More than 36,000 people said on Facebook that they would attend a protest at the capital’s Place de la Concorde. The unrest, so far, has left two dead and 606 injured in mainland France, the Interior Ministry said on Thursday. "the fluorescent yellow jackets that all motorists in France must have in their cars"